Today @fourcornersusa1 honors those who endured the most deplorable actions imaginable through a series of tweets from the IDF (@IDFspokesperson) and others. Be sure to click on the tweet link to read her full story. From one of my dearest tweeps. If you are on Twitter, @DrMartyFox is a must #follow. “JERUSALEM – Israeli Prime Minister Benjamin Netanyahu opened the country’s annual memorial day for the 6 million Jews killed in the Holocaust by issuing a stern warning Sunday to the world to learn the lessons of the past and prevent another Holocaust. At the opening ceremony at the Yad Vashem Holocaust memorial, Netanyahu linked the Nazi genocide to Iran’s suspected drive to acquire nuclear bombs and its leaders’ repeated references to the destruction of Israel and its denial of the Holocaust. Netanyahu said that just like before World War II, there were those in the world today who refused to face uncomfortable truths.” Read full coverage here. “Congress established the Days of Remembrance as the nation’s annual commemoration of the Holocaust and created the United States Holocaust Memorial Museum as a permanent living memorial to the victims. Holocaust remembrance week is April 27–May 4, 2014. The theme designated by the Museum for the 2014 observance is Confronting the Holocaust: American Responses.” Learn more from the Museum here. On April 28th, the Holocaust Remembrance Day will be commemorated in concert. The Czech Embassy presents “Phoenix from the Ashes: Terezín in Words and Music“, a free concert honoring composers and writers at Terezín (Theresienstadt) concentration camp, to commemorate Holocaust Remembrance Day April 28. Read the remainder of The Examiner article here. “The Holocaust is a great warning to us all. We shall never forget our sisters and brothers. We have to ensure that it is not repeated and to ensure that we never go back to the days when humans behaved as beasts. Forgetfulness is a menace, we must remember and remember to love and respect everyone no matter the color of their skin or the origin of their birth. Moses taught us that every human being was made in the image of the Lord, no one has the right to take that away. “Even today, when there is broad agreement that the Holocaust should have been prevented, the world is not crying out in the face of a regime that calls for our destruction and even receives with open arms the man who represents it. In the face of a state that openly calls for the destruction of the state of the Jews, everyone clears their throat in the face of the smiles. The attitude toward the State of Israel is not proportionate to the issues that are on the agenda. It also shows us that in the harassment of Jews there is thousands of years of continuity to the phenomenon of anti-Semitism. If you think you know the names of the majority of Nazi concentration camps, you don’t. View the list compiled by the American-Israeli Cooperative Enterprise here. Note they say the list is still incomplete. 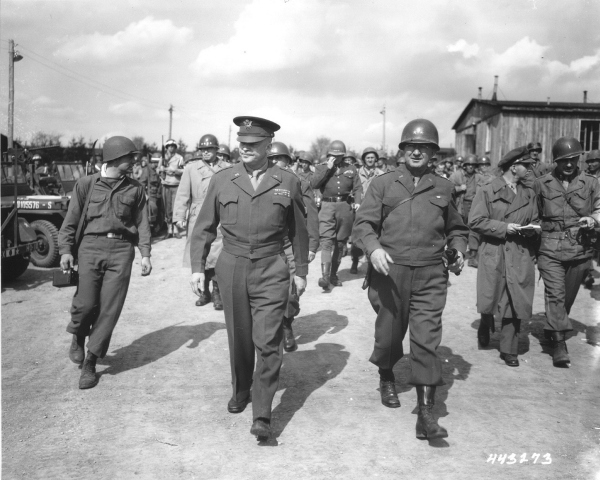 General Dwight D. Eisenhower and General Troy Middleton, commanding general of the XVIII Corps, Third US Army, tour the newly liberated Ohrdruf concentration camp. Ohrdruf, Germany, April 12, 1945.